The NS370S is a SAS to SAS/SATA JBOD rackmount chassis that comes with the latest miniSAS(SFF8088) interface for direct connection to host PC, server and workstation with single or two high-bandwidth mini-SAS data cable for four(4) multiple hard disk drives. This enclosure is compatible with both high capacity SATA III and enterprice SAS HDDs, providing users an easiest way and solution to expand a high density, high capacity, and low cost storage. Each hot-swappable tray on NS370S provides power and activity LED indicators for each hard disk drive; in addition, the enclosure has built-in user friendly ultra-quiet cooling fans and environmental monitoring features with LEDs and mutable buzzer alarm for fan failure and over-temperature. 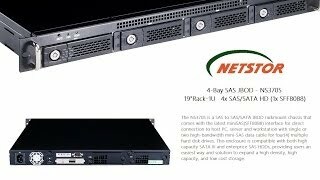 If you buy this NetStor 4-Bay SAS JBOD and hard drives we do free build and test for the unit and hard drives. So you can use this device straight out of the box. All free of charge in NS370S price.